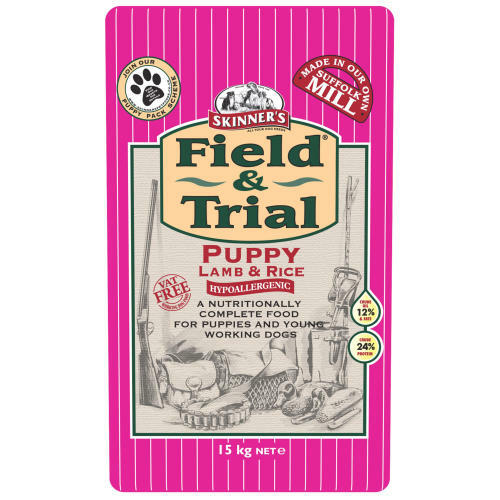 Skinners Field & Trial Lamb Puppy Food is a delicious lower protein recipe made with easily digestible British lamb meat meal and rice. Suitable for puppies and young working dogs to support them throughout the vital stages of their development. By feeding Skinner’s Puppy Lamb & Rice from weaning you will ensure that your puppy receives all the proteins, carbohydrates, vitamins, minerals and oils which are essential for steady growth. A lower protein level ensures this steady growth is controlled which is particularly important for medium and large breeds of dog. Skinner’s Puppy Lamb & Rice is wheat-gluten free with British lamb meat meal as the single meat protein source which is easily digestible for your puppy’s delicate stomach. It also contains a unique blend of traditional culinary herbs known for their beneficial properties: seaweed, alfalfa, thyme, fennel, basil, parsley, peppermint, garlic, paprika, rosemary, sage, aniseed, fenugreek and yucca. Skinner's Field & Trial range is VAT free. Whole rice (38%), Lamb meat meal (19%), Oats, Sunflower oil, Pea protein, Linseed, Whole peas, Brewer’s yeast, Beet pulp, Sunflower expellers, Whole dried egg, Vitamins, Minerals and trace elements, Culinary herb mix, MOS, FOS.